"The Day Superman Married Lana Lang!" "The Mad Woman of Metropolis!" 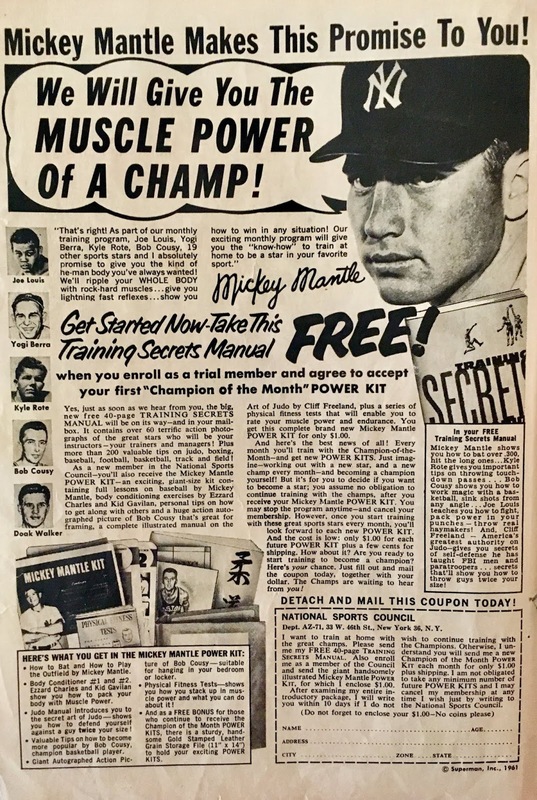 Several months ago... too many months ago, I received a message from my pal, Jody Yerdon. He asked me to cover an issue of Lois Lane... however, at the time, I wanna say we were still in the throes of #VartoxWeek (praise be). Ya know, now that I think about it... we might've actually still been working on #Action100. Wow... 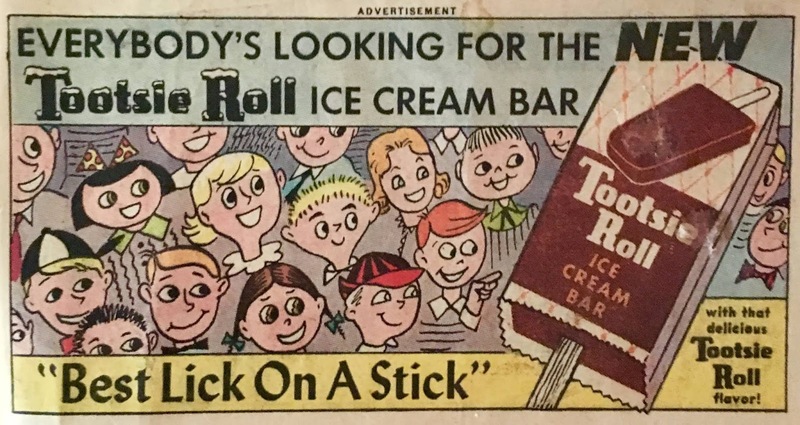 I hope it wasn't that long ago! Whatever the case, I figured as soon as I was done with whichever project I was working on, I'd do up a Lois discussion. That's when I came to learn that the only issue of Lois Lane I already discussed here... was the only issue of Lois Lane that I owned! I guess I confused Lois Lane with Jimmy Olsen, which I somehow have a couple dozen issues of! Anyhoo, long story... not as long, I finally got myself another issue of Lois (you know how we roll here, physical copies only!)... and we're going to discuss it... right now! Apologies and Thanks to Jody! 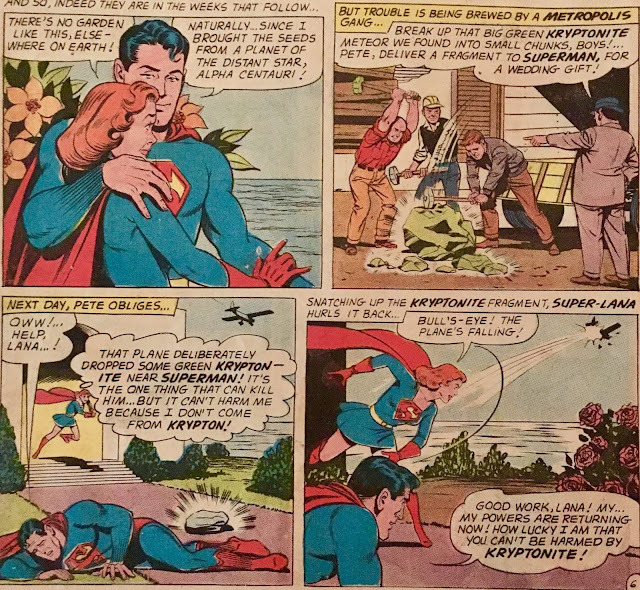 Our first story opens with Superman presenting some ungodly horror of a statue to the Metropolis Space Exhibition. Lana Lang is looking on... and keeps looking on when Superman flies away. Using her spyglass, she watches as he lands on a nearby (probably a bit too nearby) building to change into his civvies. And just like that, she now knows Superman is really... Clark Kent. Later that day, she meets with Lois for some lunch... and wouldn'tcha know it, the subject of conversation is... Superman's secret identity! Lois thinks she's got the whole thing figured out... Superman is, in actuality, the Metropolis District Attorney, David Prentice! Lana decides not to spill the beans of her own discovery. The next day is the day of the annual Metropolis Friendship Day Parade... and naturally, Superman is a big part of that. Lana manages to pull him aside so they can chat, and once they're alone... breaks the news that she knows his secret. Superman laughs (chuckles, even! ), but doesn't deny anything. And then, Lana does the unthinkable... asks that Superman use his super-hypnotism to wipe her memory clean of the knowledge! This unselfish act is enough for Superman to fall madly in love with Lana, right there on the spot! He even asks her to marry him... again, right there on the spot! Before we know it, we're at the wedding. Lois, Lana's Maid of Honor, cries her way through the entire ceremony. Worth noting, Superman's Best Man is... a Clark Kent robot. Mr. and Mrs. Superman then head up to the Fortress of Solitude... so he can give her a dose of Korium-66-Beta (that sounds sciency, doesn't it? ), which would permanently give her super-powers. He claims that she can do this because of her A-Blood-type (Lois is Type-O). 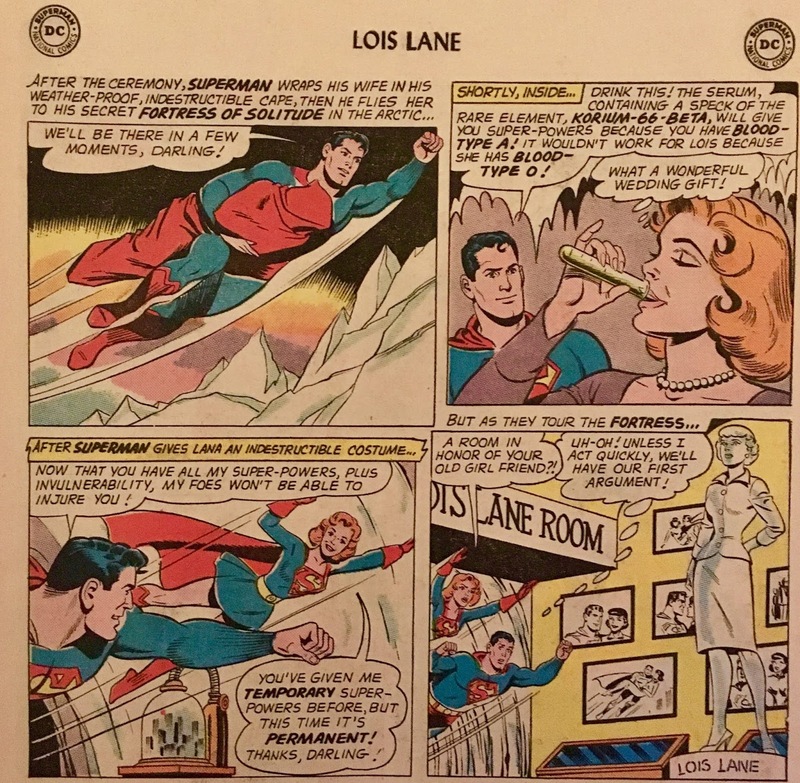 Speaking of Lois, Lana heads into Superman's creepy shrine in her honor... the Lois Lane Room! 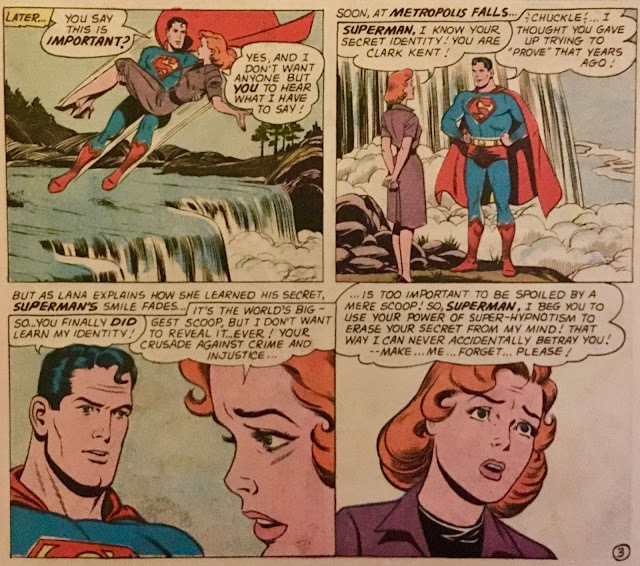 Superman, fearing this might lead to their first married argument, does what any fella would do... punches his Lois Lane statue into millions of pieces! We jump ahead to the honeymoon... Superman and Super-Lana (creative!) head to his spectacular floating estate at sea. The next day, however, some nogoodniks decided to drop a chunk of Kryptonite (by air) onto the estate, which knocks Superman for a loop. Lana, isn't affected, however... and just hurls the rock into the passing plane! Then... this sorta thing happens a few more times. Some goon drops Kryptonite chunks... and Superman goes down. 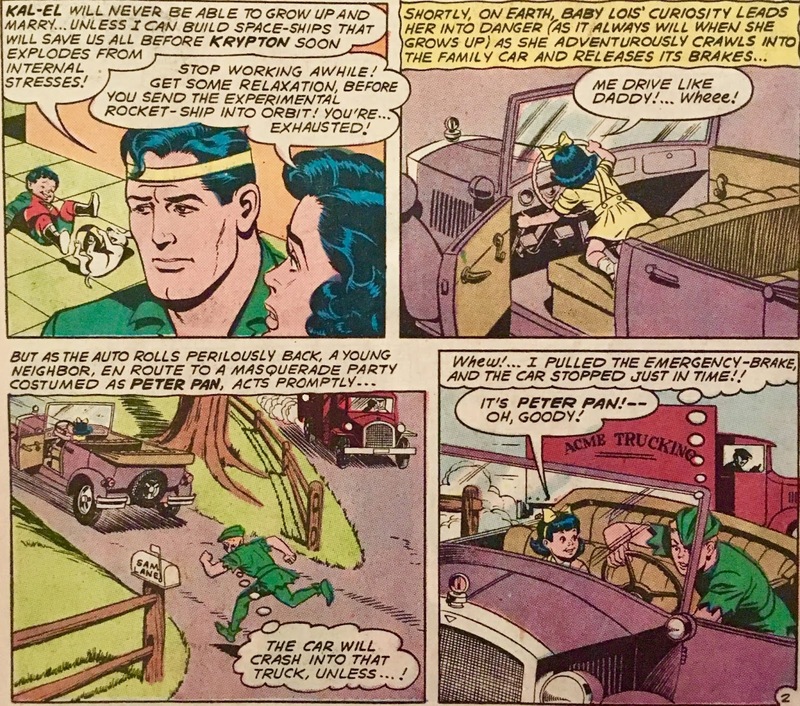 Super-Lana saves him time and time again. Even the news picks up on it! Lana realizes that this is really getting to her super-husband, and decides it might be best for them to leave the city for awhile. They head down to Africa to join Lana's father, Professor Lang on an archaeological dig. Wouldn'tcha know it, shortly after they arrive, Lang's assistant unearths some Red Kryptonite! Red-K, of course, always affects Superman in different ways. 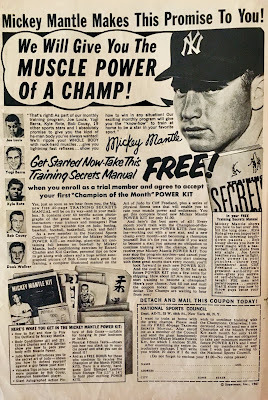 This time (well, most times), it turns him into a Super-Fiend! The effects last long enough for him to return to Metropolis and destroy the whole place! At this point, Super-Lana decides it best to... get this... leave Earth forever! She thinks doing so will give Superman back his self-respect. All's I can wonder is... who'll be there to chuck the chunks of Kryptonite away from him now?! Our next story takes place during Lois Lane's childhood (just as the title suggests). We open with Sam and Ella Lane watching their young daughters. 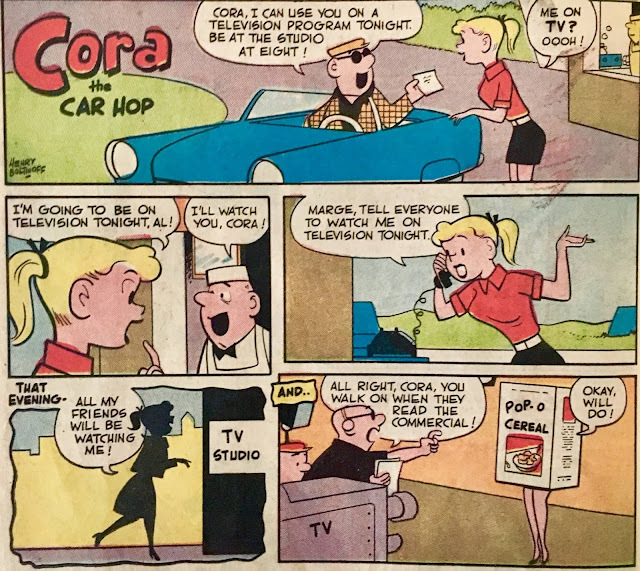 Sam is tickled that Lois is reading Fairy Tales, and from this, suggests that she'll grow up to be a writer... a reporter, even! That's kind of annoying, isn't it? Like, if a baby reaches for a baseball or something, and the parents say "He's going to grow up to pitch for the Yankees!" 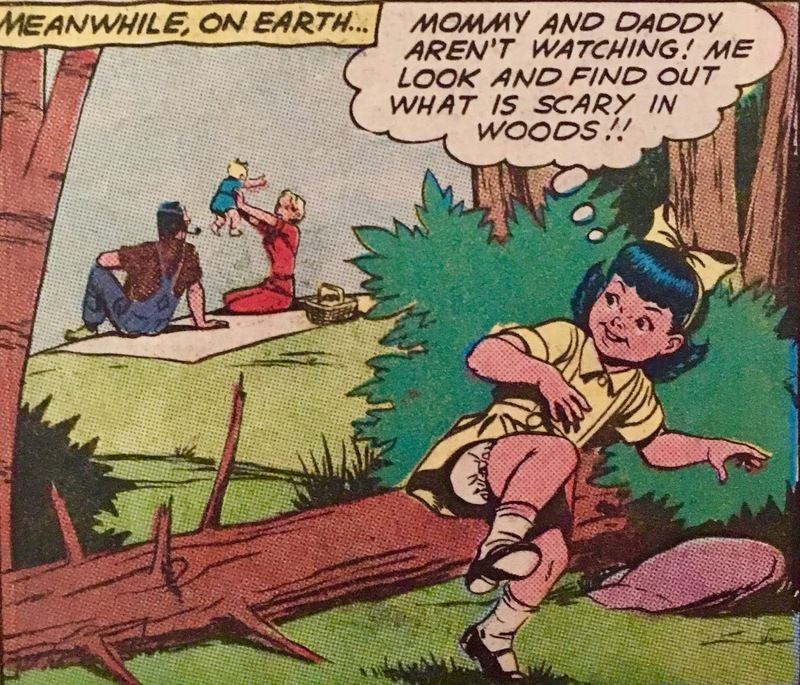 Worth noting, Ella is certain Lucy Lane will grow up to be an actress. How she deduces this from brushing the tot's hair, I'll never know. 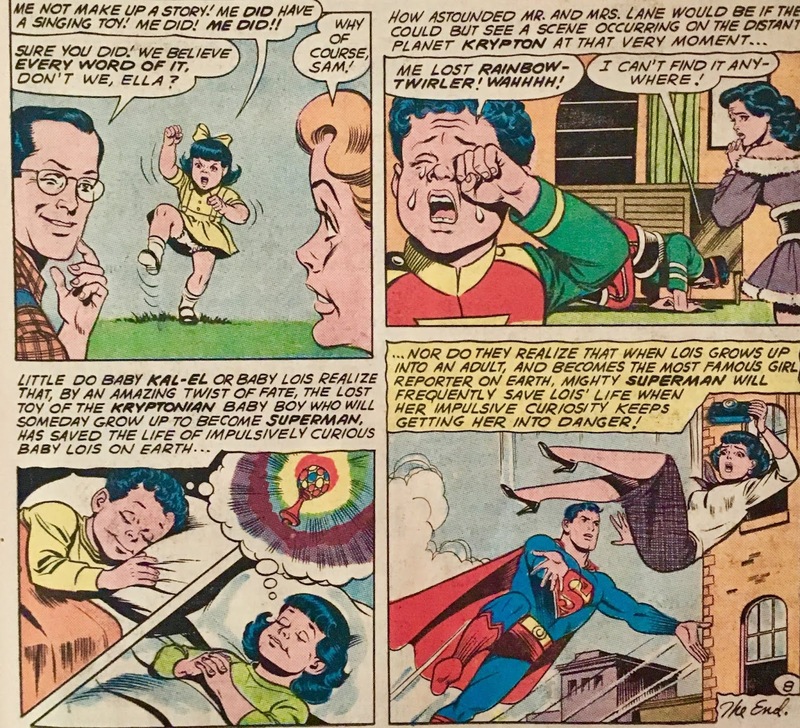 Anyhoo... from here we get a few comparisons between Lois and Kal-El's childhoods... basically, that Lois was a precocious scamp and that Kal's rocket trip was predicated on the fact that his parents feared that he'd never marry. 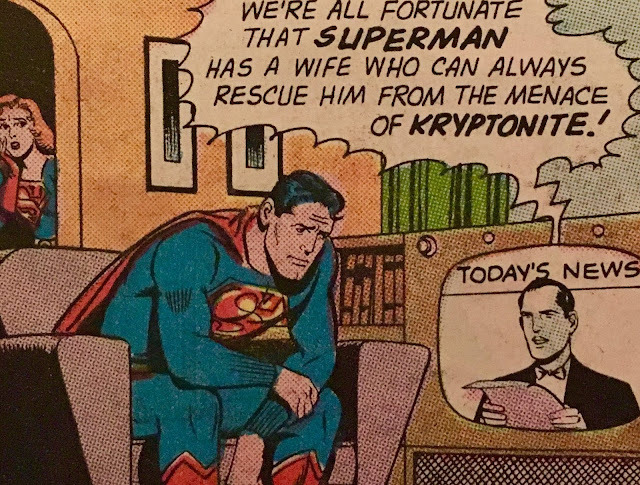 Yeah, when the "landquakes" started to become an issue on Krypton, Jor-El's first worry was that his son would never get married! Hell, even if Krypton never went boom, it's gotta be like a 50/50 shot Kal would be able to pass the Matricom test anyway. 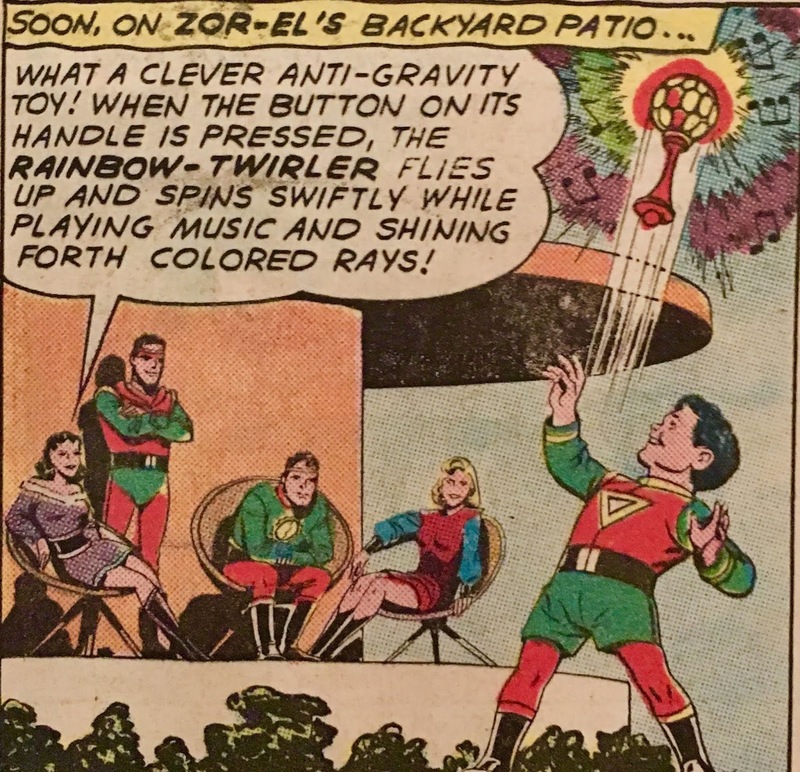 After a few more pages of interweaved childhoods, Kal is gifted a "Rainbow-Twirler", think part baby rattle, part zero-g light-show. 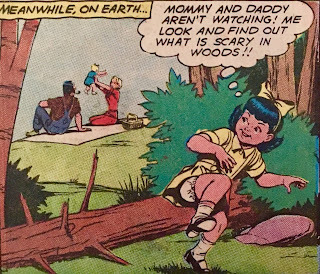 The Lanes are on a picnic... and despite her father's warnings, Lois heads into the woods to do some exploring. Here's where things get silly...er. Baby Kal is climbing on his father's test rocket, and accidentally drops his rainbow twirler into the cockpit. 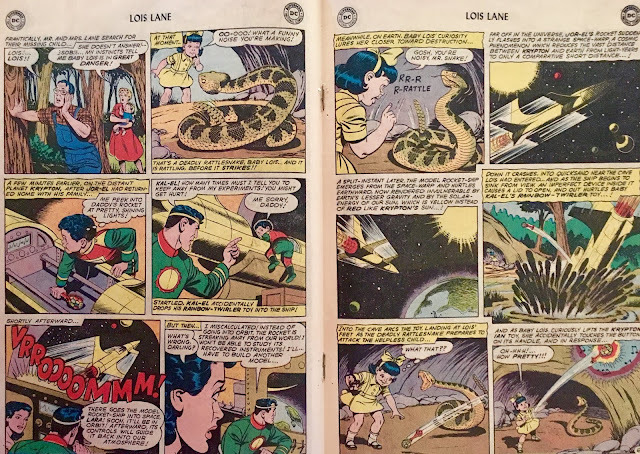 On Earth, Lois happens upon a rattlesnake! She's not scared by this in the slightest... which makes me wonder why Abin Sur's ring didn't seek her out that fateful day! Anyhoo... the test-rocket was fired off to Earth, where it wound up crashing like ten yards away from Lois and the rattler. The strange Kryptonian toy bounced out of the wreckage... it started glowing, and scared the snake away. All's well that ends well... Lois's folks don't believe a word of her story (hey, maybe she'll become a reporter yet!). 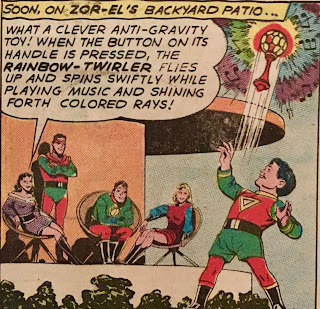 Back on Krypton, baby Kal cries over losing his Rainbow-Twirler... but, little do either of the tots know, that was only the first time that Kal-El would save Lois Lane from danger! 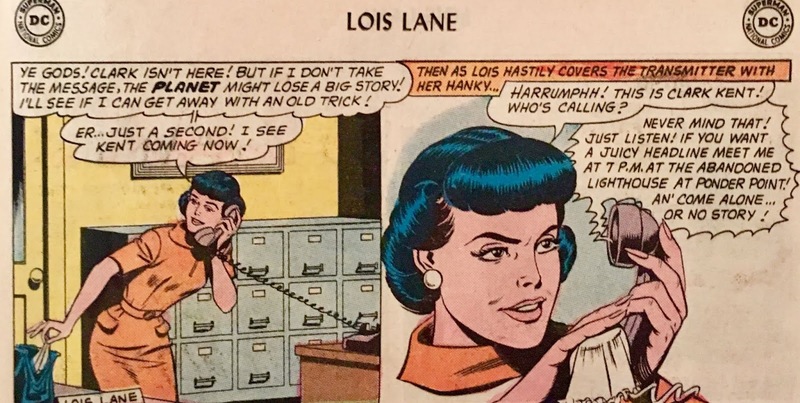 Our final story opens with Lois answering Clark Kent's phone at the Daily Planet office. The person on the other end of the line really needs to talk to Clark, and so, Lois disguises her voice by putting a tissue over the receiver... oh, the classics! She's informed of some goings-on that night at the Ponder Point Light House. There's a big story, but it's only for Clark Kent. So, what's a girl to do? 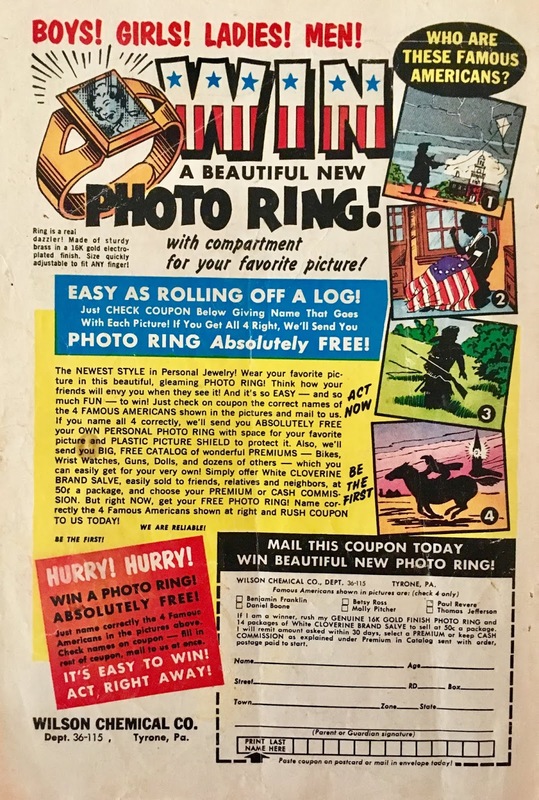 Well, if that girl is Lois Lane, I suppose you dig around in Jimmy Olsen's disguise trunk and dress up like Clark Kent! This takes her an entire hour, by the way. 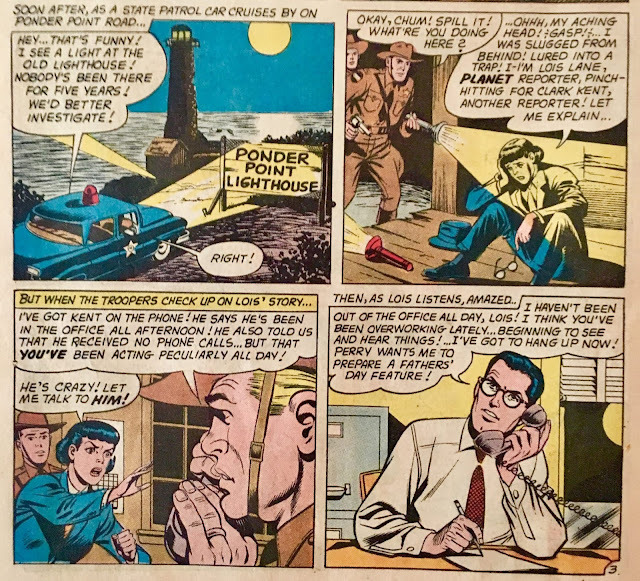 Later that night, Lois-as-Clark arrives at the Light House. Upon entering, she is walloped with a slapjack, and kayoed. The police, noticing a light on at the abandoned lighthouse, decide to investigate. Finding a dizzy Lois, they question her. She tells them everything... how she answered Clark's phone for the tip and everything. 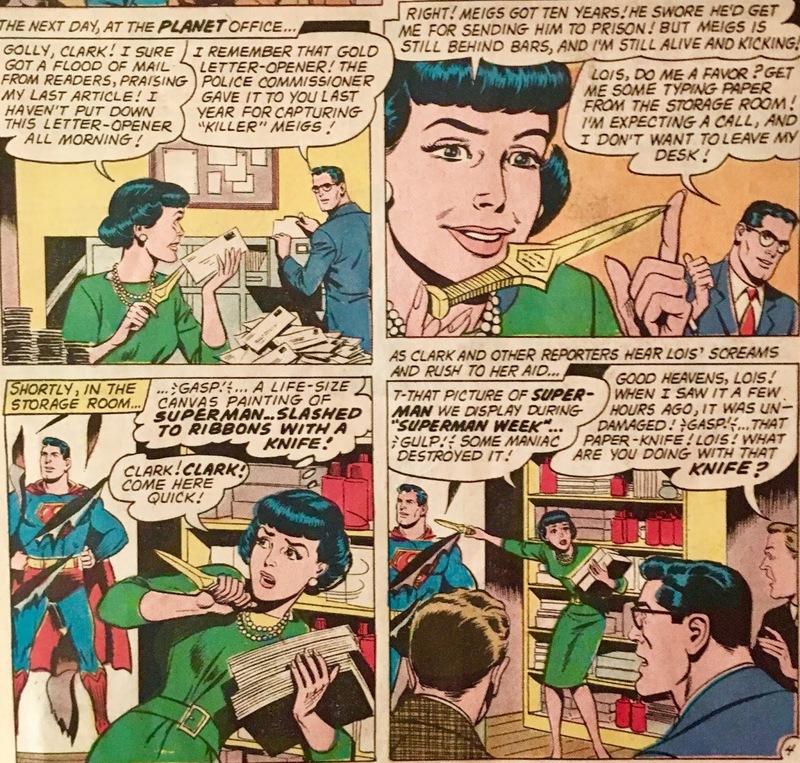 The police decide to call the Daily Planet, and Lois is surprised to learn that Clark was in... and claimed to have been there the entire day! The following day, Lois opens some fan-mail... with a fancy gold letter-opener, gifted to her by the Police Commissioner after she assisted in getting "Killer" Meigs put behind bars. Honestly though, with a nickname of "killer", it was probably just a matter of time. 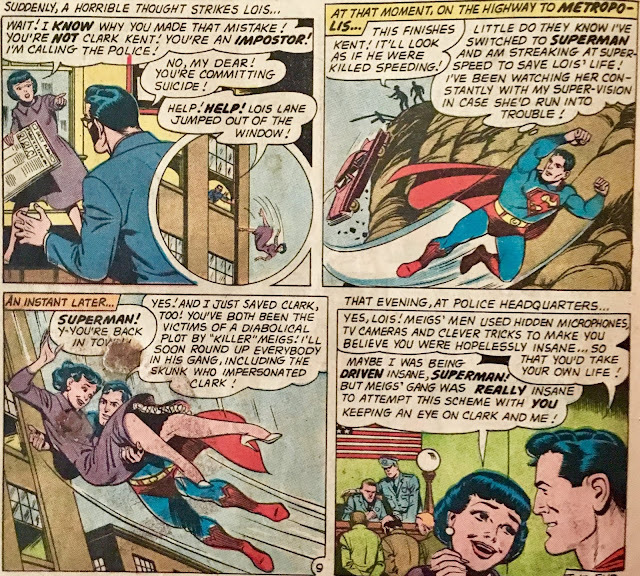 Anyhoo, Clark asks her to run to the supply closet for some typing paper... and when she does, she discovers a Superman poster ripped to shreds! 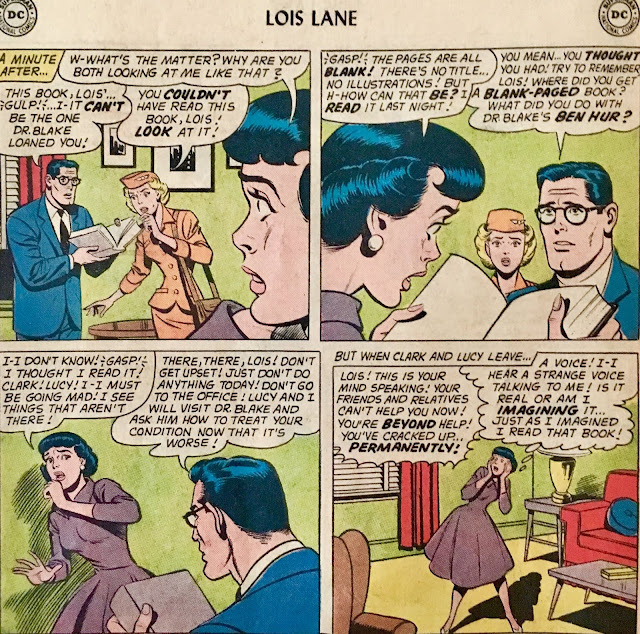 She freaks out... and when her workmates come to find out what's up, all they see is a frantic Lois... holding a letter-opener... next to a shredded and stabbed poster! Ruh-roh. A worried Clark Kent decides it might be time for Lois to visit a therapist. 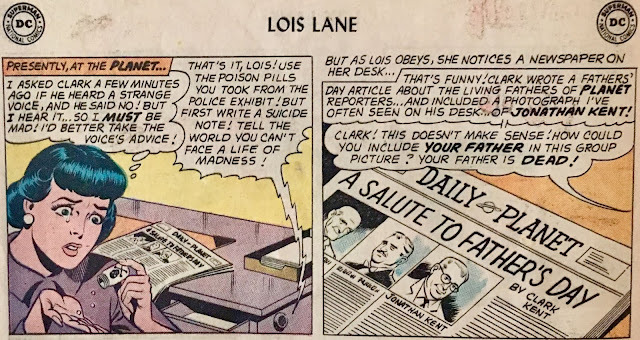 Oh, also... Lois is carrying around a bottle clearly marked "poison". Lois agrees to talk to a psychologist, who looks very much like a bald Oliver Hardy, and tells him of her preoccupation with Superman. 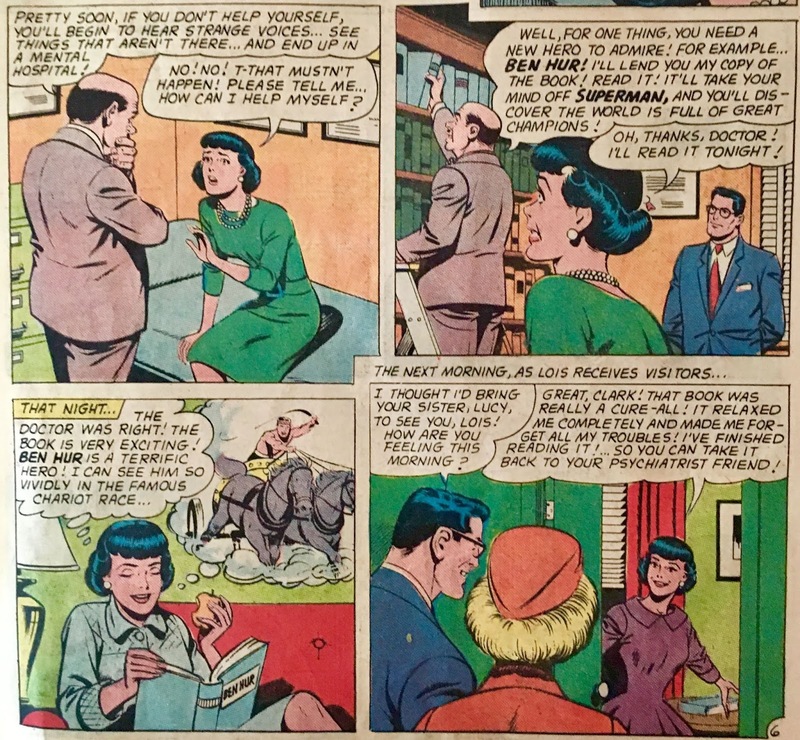 The doc decides it might be in Lois's best interests to... read Ben Hur! He claims that this will show her that there are more "champions" in the world than Superman. She decides it might be a better idea then stumbling through the day with a pocket full of poison pills, and so, she agrees. That night, she devours the book... like, in reading terms, she didn't eat it... she's not that unhinged. The next morning, she hands the book over to Clark so he can return it to his doctor friend. Clark flips through the book and is disturbed to learn that all of the pages... are blank! Lois freaks out, as you might imagine. Clark then excuses himself... he needs to write a Father's Day piece for the next edition of the Daily Planet. 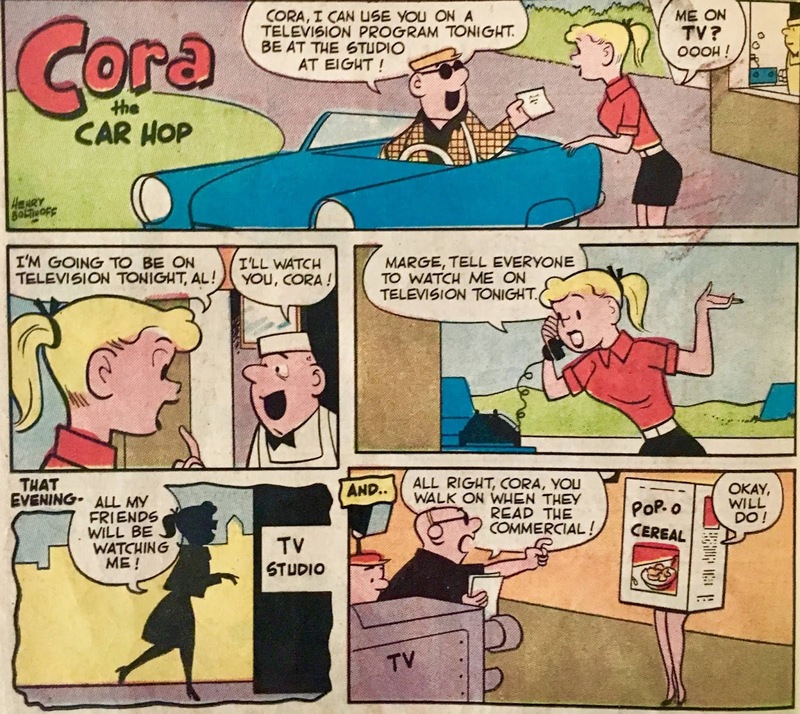 Then, now alone... poor Lois begins hearing voices... well, a voice claiming to be her own mind, anyway! So, just what's going on here? Well, it would seem that "Killer" Meigs' men are trying to convince Lois that she's crazy... ultimately in hopes of getting her to commit suicide! We shift scenes over to their headquarters, where they have Clark Kent tied to a chair. 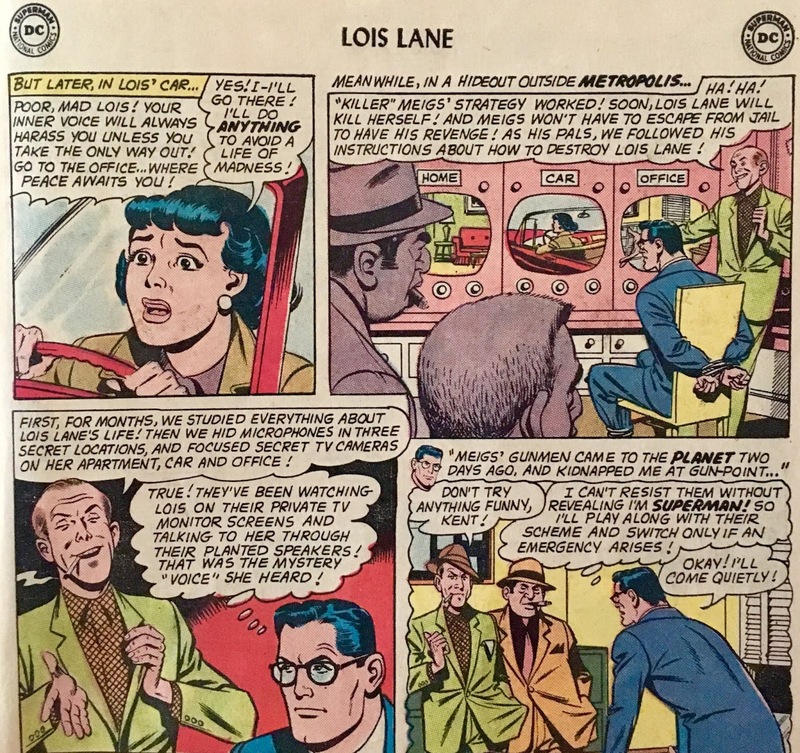 There is a bank of monitors in front of him, showing places where Lois is known to be at all times... including her car! 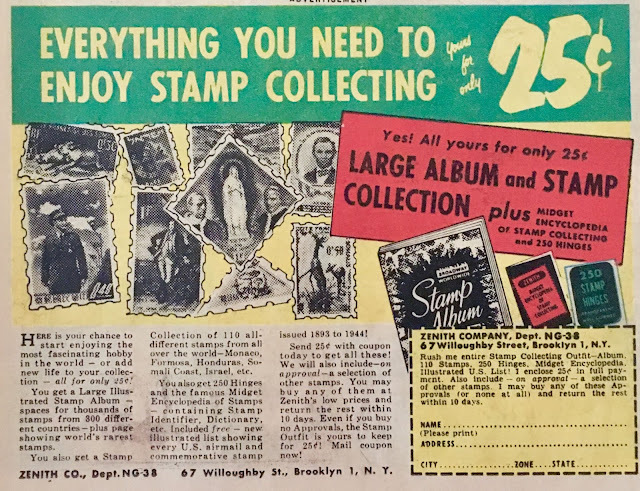 Wow, this is like a half-century before drone technology! Back at the Daily Planet... Lois' mind tells her to take the poison pills! 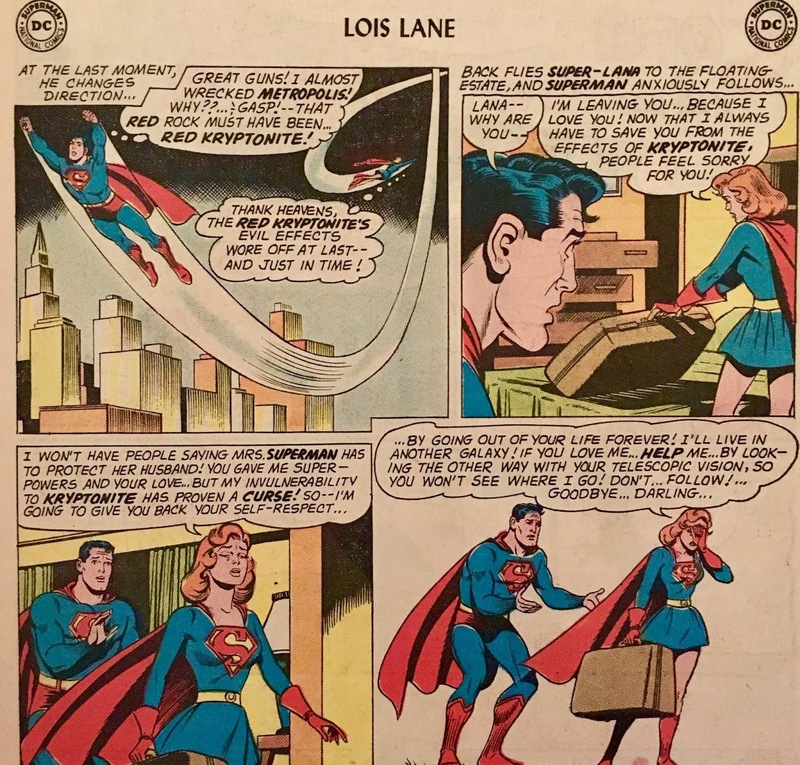 She figures she might as well... but before she can, she notices something odd about the front page of the paper... Clark's Father's Day piece includes a mention of Jonathan Kent! 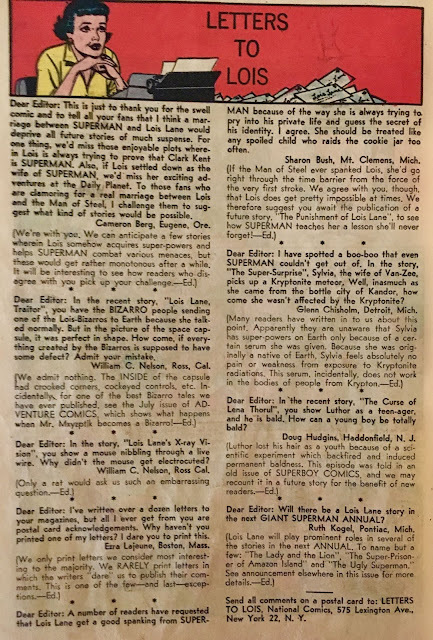 Apparently, this story was only supposed to be about the living fathers of Daily Planet staffers... which, kinda seems like B.S., right? I mean, if Clark Kent is writing the piece, it would stand to reason he'd write about his own father, be he living or dead, right? 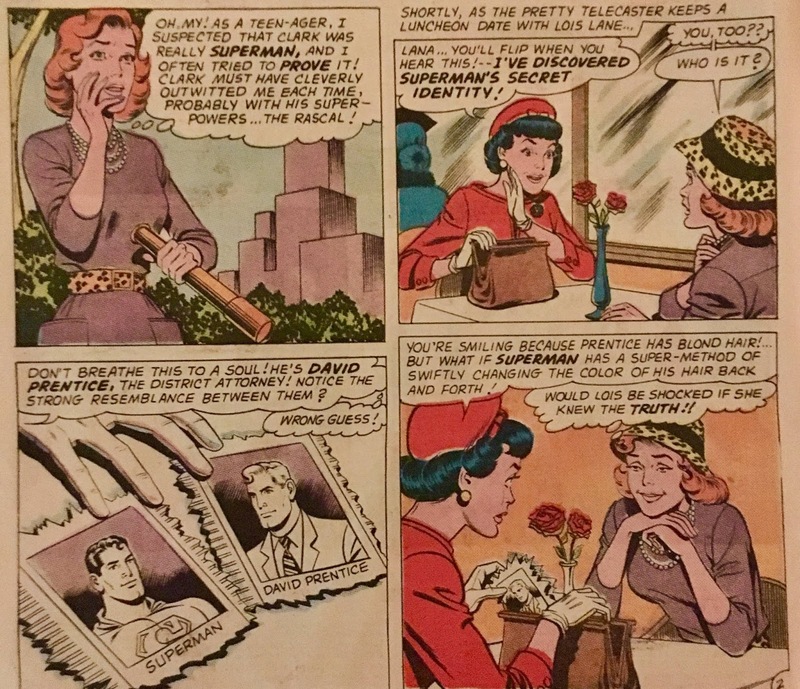 Annnnyway, this "evidence" is enough for Lois to deduce that the Clark Kent that's been sitting next to her for the past couple of days has been... an impostor! Fake Clark reacts to this by... throwing her out the window! At the same time, the real Clark Kent is pushed off a cliff by "Killer's" goons... they make it look like a car accident though. This gives CK enough time to change into his Superman duds and save Lois Lane, gaslighted no more! Well, that was sure a lot of story, wasn't it? Let's start with... the end. The final story was definitely the strongest. It seems like the broader internet just recently discovered the term "gas-lighting" (it's like this decade's "shadenfreude" or "Schrodinger's Cat")... that said, I'll try not to overuse it here. This is a really clever and enjoyable (for the time) little tale of Lois being convinced that she's lost her marbles! Sure, there are a few reachy moments in it... and the ending was a bit of a dud, but there was still a fair amount to dig here. 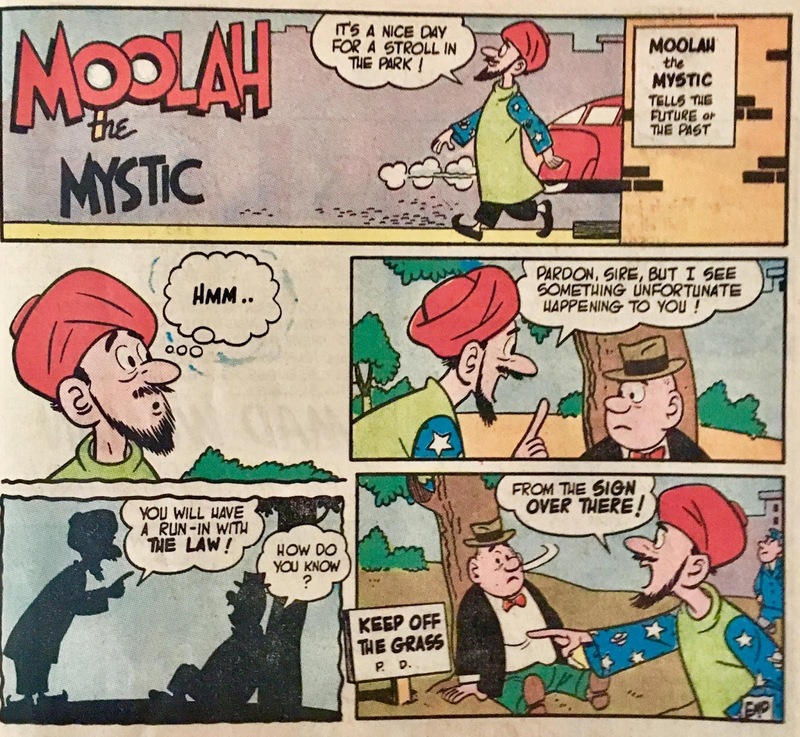 Well, mostly the fact that the story facilitated a bunch of neat sight-gags. Having Lois disguise herself as Clark Kent (and taking an hour to do so!) was a hoot. Just the idea that Jimmy Olsen has a trunk full of disguises at the Daily Planet, is a riot in and of itself! 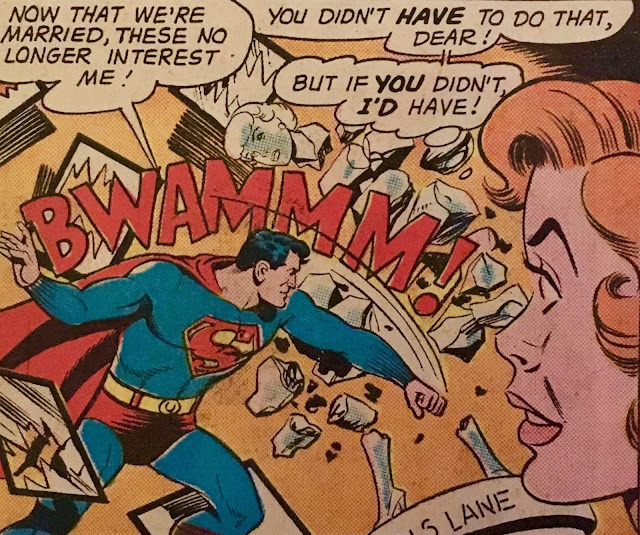 Also, ya just gotta love the image of Clark Kent throwing Lois out a high-story window! The climax, as mentioned, was a real dud. Lois deduces that Clark is an impostor because he wrote about his father in a Father's Day piece... which was only supposed to be about living fathers? The hell kinda article is that?! Could you imagine being tasked with writing a Father's Day article... and not being allowed to mention your own father because he passed away?! What kinda blackhearted operation are the Planet running here anyway?! We can also hop into the "overthinking it" department... if the real Clark Kent was captured for a couple of days, that also means Superman didn't do anything for a couple of days, right? That seems kinda weird... and, ya know... kinda irresponsible. Putting the needs of just Lois over those of the entire city/world... yeah, I'm definitely overthinking it. Our "feature" story was probably my second favorite... which, really isn't saying all that much. I get that it's (clearly marked as) an Imaginary Story... but, it's still kinda sloppy. As mentioned above, when it ended, all I could think about was the gang who kept leaving chunks of Kryptonite around... without Super-Lana, Superman would very likely not survive the next few rounds! 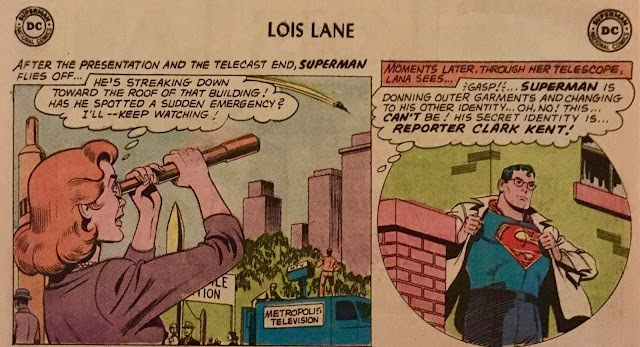 Speaking of sloppy... Lana discovers Superman's secret identity... by using a spyglass? Really? Of all the people on the planet, Lana Lang is the first person to think of just following him with a spyglass?! Lana Lang... who has been trying to prove this her entire life... and couldn't! Coming from a town that had like a dozen people (plus Superboy) living in it, and couldn't connect the dots... okay, okay, I'm overthinking it again. Our middle story... ehh. 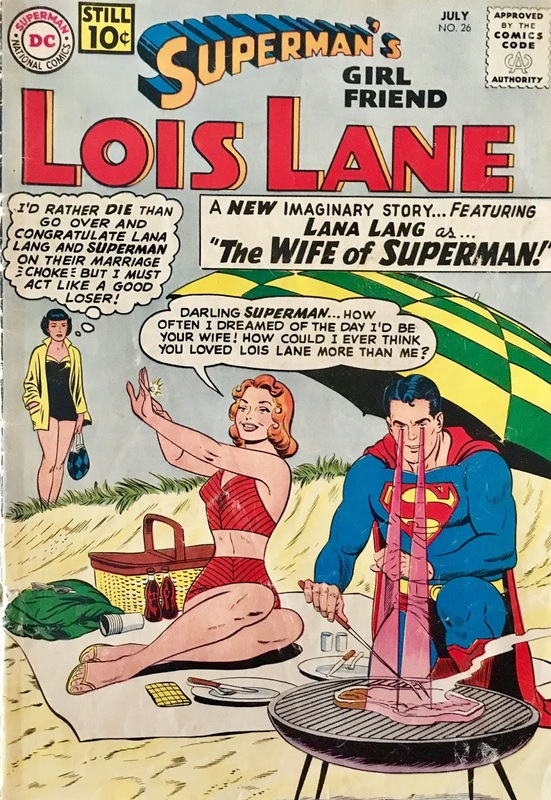 I think the last time we discussed an issue of Lois Lane I mentioned that the stories had a bit of a "marriage fetish"... and this issue is certainly no exception. 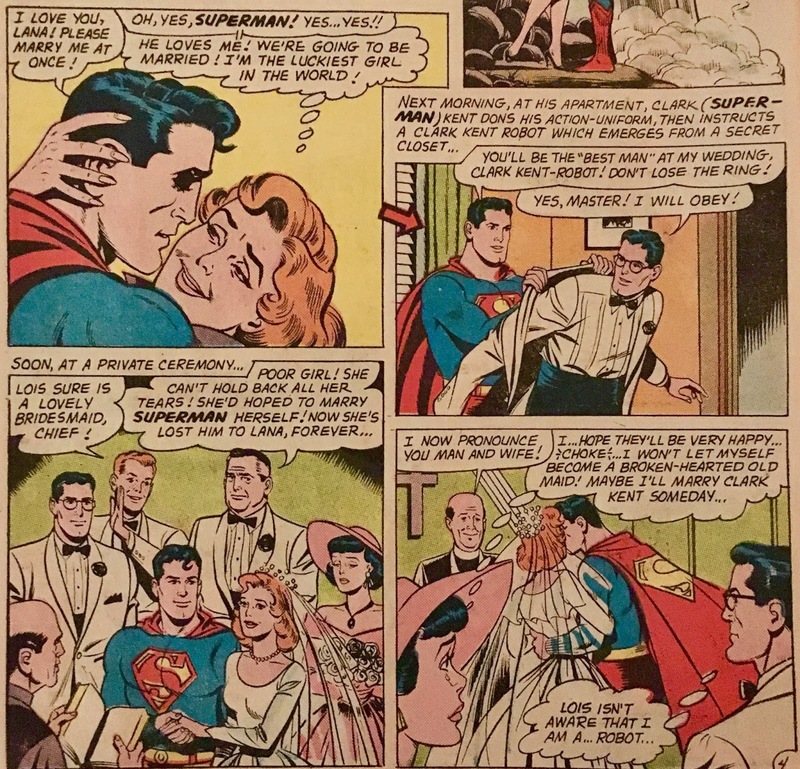 While the first story actually features Superman getting married, the middle one shows Jor-El as being fearful that his son will never get the opportunity to wed! What a weird initial thought to have when you're facing the probability that your entire planet's about to go "boom"! I did dig Lois's fearlessness when confronting the rattlesnake. I really feel like there's an Elseworlds story out there where Abin Sur's ring somehow winds up on her finger... I mean, she's clearly fearless... and doesn't require any reprogramming like Hal did! Overall... an enjoyable romp through some silly and weird stories. 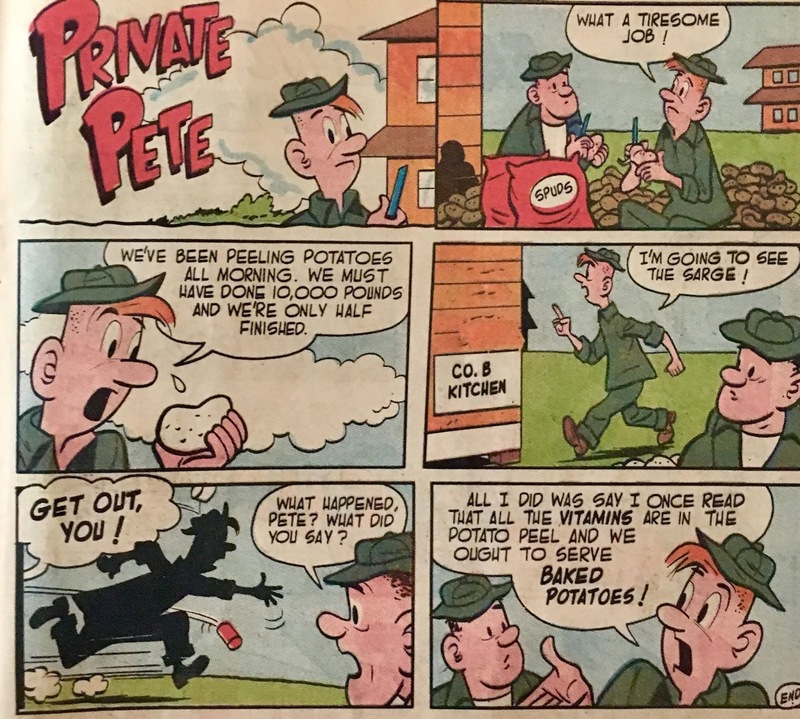 Sure, they're not the strongest you'll read... but, really... I don't think it's meant to be! Just silly fun, and well worth a look. Not something I'd break my back or bank over... but, if you happen across a beater copy, you could do far worse. 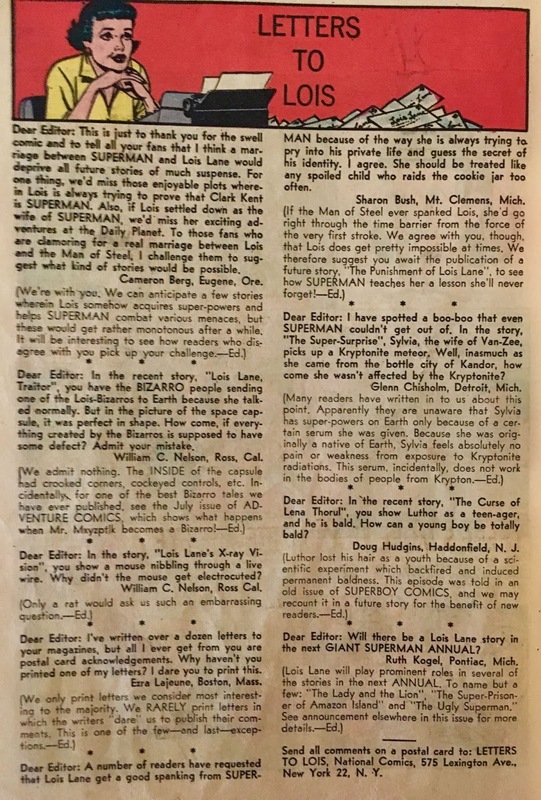 This issue is not available digitally (as of this writing), however, it is included in SHOWCASE Presents Superman Family, Volume Four. 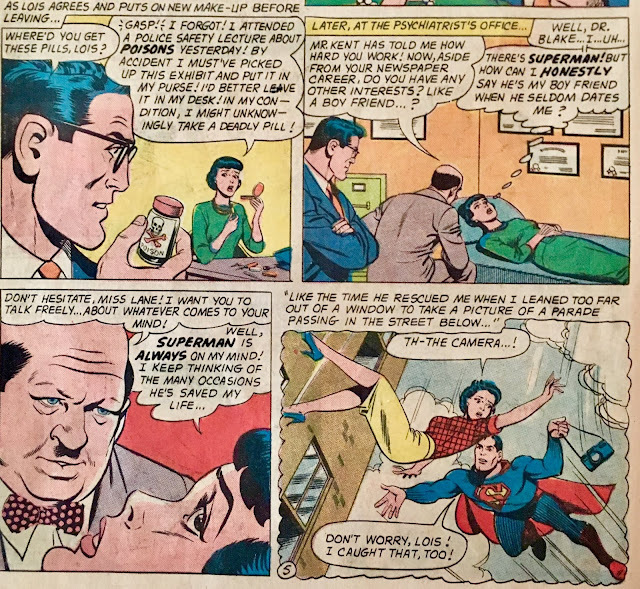 I was almost sure that Curt Swan drew the first story, then I saw that panel with Lana's goofy, lovesick face, and I was like nope, that's Schaffenberger all over. Now to get myself a dandy photo ring! I know the term has been around for awhile, but I think Steely Dan led the popularization of the term "gaslighting" with their 2000 album, "Two Against Nature" which featured the song, "Gaslighting Abbie." Anyway, that's where I discovered it.